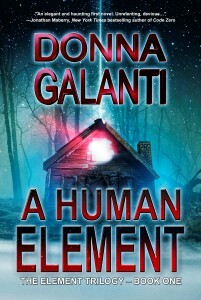 A Human Element cover is here and an excerpt! This week I got to experience something thousands of people do every year. If they’re lucky. And I know I am. 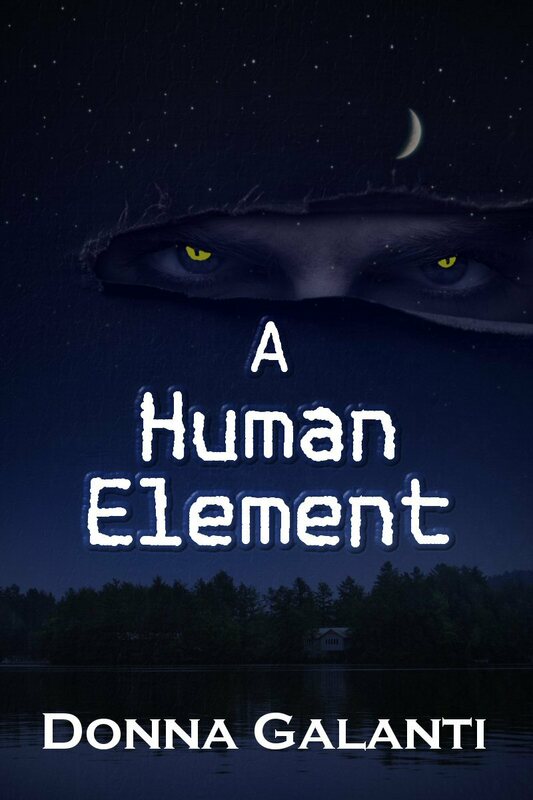 To see the cover of something I created from my own imagination, my paranormal suspense novel A Human Element. And my first book. When I saw the tweet from my publisher, Echelon Press, “I just sent something very important to your email” my first reaction was one stemming back to high school. Oh no, what bad thing did I do and just get caught for? Then I zoomed back to my 40s and I knew. THE COVER! It’s just a whole mess of dark coolness, don’t you think? One by one, Laura Armstrong’s friends and adoptive family members are being murdered, and despite her unique healing powers, she can do nothing to stop it. The savage killer haunts her dreams, tormenting her with the promise that she is next. 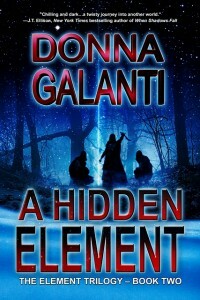 Determined to find the killer, she follows her visions to the site of a crashed meteorite–her hometown. There, she meets Ben Fieldstone, who seeks answers about his parents’ death the night the meteorite struck. In a race to stop a mad man, they unravel a frightening secret that binds them together. But the killer’s desire to destroy Laura face-to-face leads to a showdown that puts Laura and Ben’s emotional relationship and Laura’s pure spirit to the test. With the killer closing in, Laura discovers her destiny is linked to his and she has two choices–redeem him or kill him. And I know you’re wondering…who’s the evil, yellow eyed dude in the sky? I won’t divulge his name just yet. But he would be glad to hear he’s called evil. Very glad. Here is a little teaser to him.. The creature-man sat on the concrete floor, his bulbous legs splayed out in front of him. His head sunk on his chest. He appeared to be sleeping. Yet he did not sleep. He reached his brain premier-pharmacy.com/product/levitra/ outward into the night air probing for satisfaction. He had come so close many times. Then the vision always faded away, no longer in his grasp. He knew then what he sought either had traveled too far a distance for his mind to grab or his senses were too dull to attack. The man knew his limitations. His mind probing skills worked within a few hundred miles. He had killed many times in the outside world while his body stayed imprisoned underground. He was not always successful because they kept him drugged and this weakened his powers. It was difficult for him to push through the drugs and use his abilities, but when he succeeded it delivered intense satisfaction. Sweetly orgasmic. The man gloated over the deaths he had invoked, yet he had to be careful in his choosing. They knew when he killed as they knew his style of murder. He would then wait in fear to see if they discovered his kills. If they did, they would gas him and shoot him up with drugs. Sometimes the doctor would add something special to the cocktail injection to send spiraling waves of pain through his deformed body. Too many of them had been killed getting close to him. It was how they controlled him. The pain was intense and he was not immune to it. And so he had been reduced to mostly sucking the blood of small animals he came across in the nearby plentiful woods through his mind powers. These creatures gave him a mere flash of pleasure, but their brief squealing ended too short from his death jaws. The man placed his hands on his deformed head and soared outside of his prison walls, into the cool night air. Soon he spotted a stray mutt roaming the lamp lit streets. He sent his mind’s eye in for a closer look and swooped in to begin the ripping and tearing of canine flesh. Kathryn, you are such a great cheerleader. Thanks for all you’ve helped me do to improve this book and to NOT “show my underpants”…in my writing that is! Wow–can you believe it!? You must be so excited…and justly so! Congrats! What a cover and what a great description to draw me in! 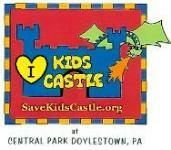 I can’t wait to see your imagination come to life…This is going to be awesome for us all!!!! Congrats on your book, Donna. I like the teaser. I love the cover. And the story sounds dark and delicious. Looking forward to reading it. Congrats! Mina…love your words “dark and delicious”! I hope you find it so! What a great way to begin the year! Congrats and best wishes for millions in sales. Ann, thanks so much. See you out and about soon!